Just thought I'd start a showroom thread for my newly acquired AW11. My daily driver Camry was about to run out of rego and I have been itching to try out AW11 ownership when I decided to bite the bullet and buy the one below. It is in need of some TLC which works out well as that is exactly what I'm looking for. It is fitted with a HKS exhaust which has been modified to connect to the factory dump pipe. I'll get some pics and more information up later tonight. 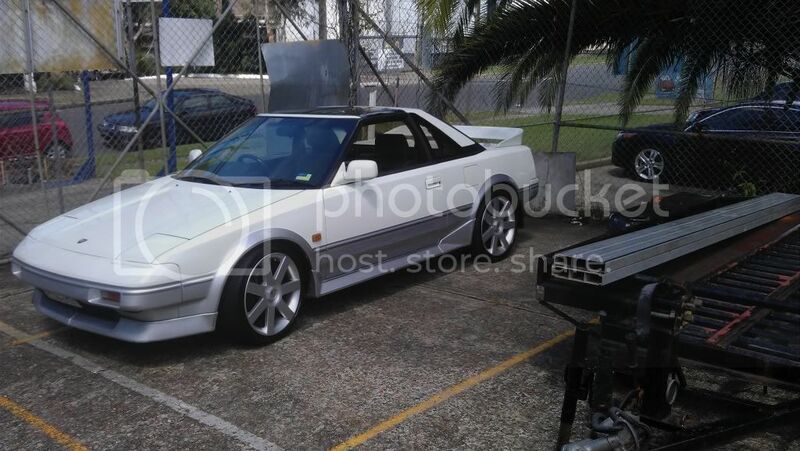 Good to see you have another Mr2. any big power plans for this one like the last car?? No big power plans with this one at all. This is my daily driver so needs to be reliable and drive like stock. I am basically wanting about 200rwkws with simple bolt ons. Have started installing an Apexi Gen3 3sgte intake kit. Should be done with that tonight. Tuesday or Wednesday I should recieve the gen3 map sensor I ordered from Japan so will install that along with a boost controller. Awesome progress! Hows the suspension? What kinda rims you planning? The suspension is suprisingly good. Much more comfortable than my old SW20. It has some sort of adjustable shocks in it with four settings. Currently on number 1. No idea what springs are in it. Wheels, no idea at this stage. It will be one of the last things done during this overhaul process. Once I'm happy with the mechanicals and missing trim/plastics have been located I'll start shopping for some rims, see what Dylan has available. On the weekend I ticked off some more tasks from my list of things to do. Completely overhauled the cooling system by flushing it with a cleaning solution, flushing that out with water. When I removed the old OEM thermostat it was actually in two pieces. No wonder it took forever to heat up, coolant could just pass straight through it regardless of the temperature. Now with a new thermostat and fresh coolant the engine seems to be running much smoother. It is idling at the correct RPM and warming up nice a fast when started from cold. I did an oil change and also installed new spark plugs. Instead of installing the Apexi gen3 intake kit I just bought a cheap pod filter and attached it to the intake piping in the boot. This is only a temporary solution. Also found the first problem with the car that I don't think I can fix myself. The gearbox is leaking fluid from what looks to be a joint in the gearbox casing. It is the large joint that has the orange coloured sealant that runs right around the middle part of the box. This might be a gearbox out fix, I hope not. Apart from the above problem that car is just getting better and better to drive. I think its really going to be quite quick once the boost is turned up from 7psi to about 15 or so once I receive the gen3 map sensor in the mail this week. Install new speakers front and rear in the standard locations. Install more missing plastic trim/covers once they are arrive from the UK. I'll be disappointed if I don't see it on Wednesday.